In this article, learn how to fix "We couldn't create a new partition or locate an existing one" error while making clean install of Windows 10/8/7. 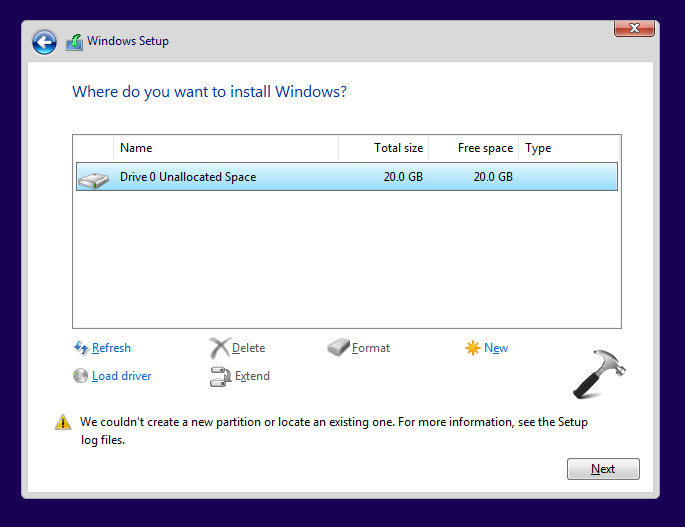 The partition was allocated space, Windows is not recognizing it in this case and thus the installation couldn’t be processed. If you’re also facing this problem while installing Windows 10, this article will help you. Try below mentioned steps and see if this solves the issue for you. 1. Start the installation process and get to the point where Windows asks you the location to install. Select the partition or drive which gives you error, click New and provide an optimum size (at least 20GB) and click Apply. 2. Then click OK in the confirmation prompt. 3. Then close the installation wizard, click Yes on confirmation prompt. 4. Restart your system and start the setup wizard, click Repair your computer link. 6. Close Command Prompt and restart the setup wizard. This time error will not display. ^^ Make sure you completed step 1 for sure, otherwise the partition won’t be listed on later steps. ^^ If ‘Format’ button active, use it and see if it helps.